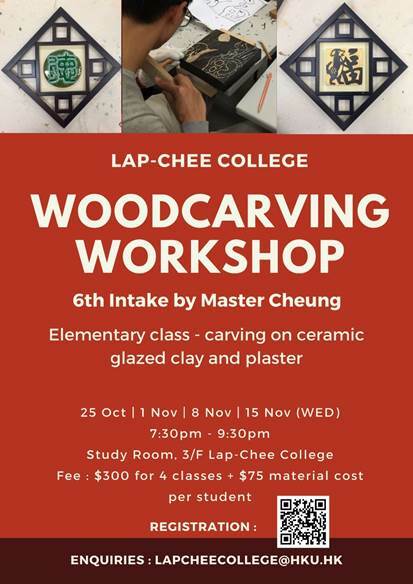 A new series of woodcarving workshops will be offered by expert Master Cheung (酉星老師) in this semester – it’s the 6th Intake running! Students will learn to carve on ceramic glazed clay (new course!) and plaster this time and you will be able to finish 3 masterpieces by yourself upon completion of the workshop. A renowned sculptor and calligrapher who has won numerous prizes in woodcarving and calligraphy. President of the Chinese Character Society of Hong Kong. Master woodcarver for Wisdom Path (心經簡林) in 2004-2005.